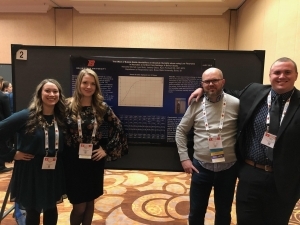 The School of Allied Health Sciences Department of Respiratory Care students and faculty traveled to the American Association for Respiratory Care (AARC) Annual International Congress 2018 in Las Vegas, Nevada on Dec 4 – 7. Boise State was well represented with four faculty awards, seven podium presentations, and six student and faculty research presentations. Lutana Haan, assistant dean for the College of Health Sciences and associate professor and chair for the Department of Respiratory Care, presented “Effects of Marijuana on Sleep” where she discussed current literature on the findings of how sleep disorders respond to marijuana use. At the congress, Haan also moderated a session on paving the way to a bachelor’s degree and served as a judge in the speaker academy where she provided feedback for new individuals interested in speaking at the conference. Jeff Anderson, associate professor and director of clinical education for the Department of Respiratory Care, presented a lecture on systematic interpretation of adult x-ray films. He also presented on systematic interpretation of adult CT scans where he provided a systematic approach for respiratory therapists to use when evaluating images from both modalities. Samantha Davis, clinical assistant professor of Respiratory Care, presented on her work with the MakerLab at Boise State titled, “Can You See It Now? Congenital Heart Defects + 3D Printing.” She discussed basic concepts surrounding 3D printing technology, familiarizing oneself with the technology, and ways that 3D printing can be incorporated into health science curricula. Davis was also awarded the NBRC Gary A. Smith Educational Award for Innovation in Education Achievement for her work with the MakerLab and creating 3D neonatal heart defects. Marselle Mitchell, Lexi Stolz, Jeremy Gibbs, and Ryan Forbush with research poster presentation. Two adjunct faculty members from the Department of Respiratory Care also performed podium presentations at the Congress. Karsten Roberts spoke on “Year in Review: Adult Invasive Mechanical Ventilation” which described the most important publications in adult invasive mechanical ventilation in the last calendar year. Brian Cayko presented a discussion on auscultation of the chest where he analyzed the essential role of physical examination of the chest and the common disagreement when describing breath sounds. Cayko was also nominated and chosen to become a 2018 fellow for the AARC Fellowship Program where he was recognized for exemplifying qualities of a true professional through educational achievement, research initiatives, publication, and clinical initiatives. Other awards were given to faculty of the department including, Lanny Inabnit, clinical assistant professor, who was awarded the 2018 Jerry Bridgers Delegate of the Year Award which recognizes someone who serves as a liaison between state respiratory societies and the AARC, and Joe Coyle, senior lecturer, who was presented with the Dr. Ralph L Kendall Outstanding Site Visitor of the Year Award by the Commission on Accreditation for Respiratory Care which recognizes individuals who review and lead program accreditation visits. Camille Stover, clinical assistant professor, presented “Words of Wisdom: Recent Grad’s Perspective” where she provided thoughtful insight on being a new graduate specifically in the neonatal and pediatric area. She facilitated an open discussion with Ira Chiefetz, medical director from Duke University in Durham, North Carolina. Ryan Forbush and Samantha Davis with their research poster at the conference. Current Master of Respiratory Care student Crystal Craddock presented case studies discussing successes and shortcomings in case management. She talked about how the respiratory therapist experience can play a vital role in case management when discharging patients to post acute care. 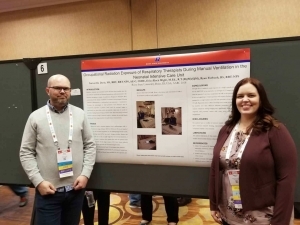 “The Effect of Bubble Bottle Humidifiers on Absolute Humidity when Using Low Flow in Neonatal Critical Care Settings: A Bench Study” – Marselle Mitchell, Lexi Stolz, Jeremy Gibbs, students, and Ryan Forbush, faculty mentor. 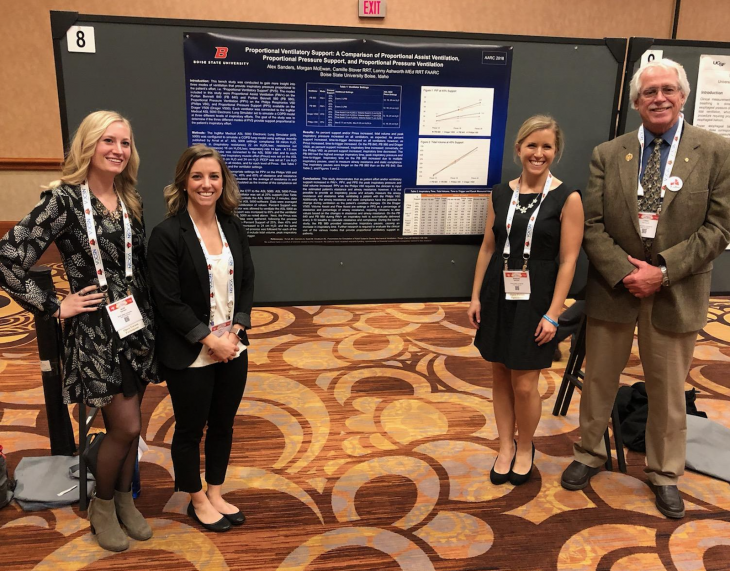 “Proportional Ventilatory Support: A Comparison of Proportional Assist Ventilation, Proportional Pressure Support and Proportional Pressure Ventilation” – Alex Sanders, Morgan McEwan, students, Stover, Ashworth, faculty mentors. “Student perceptions of 3D Printing in an Undergraduate Respiratory Care Curriculum” – Ashworth and Davis. “The Comparison of Cuff Pressure Between Spine and Sitting During Early Mobility of ICU Patients” – Tetsuya Hasegawa, 2017 graduate, Ashworth, faculty co-author. “Occupational Radiation Exposure of Respiratory Therapists During Manual Ventilation in the Neonatal Intensive Care Unit” – Davis, Forbush, and Erica Wight, former clinical assistant professor for the Department of Radiologic Sciences.